As per the National Census 2011, 69% of the India's population lives in its villages. Over 55 million of the rural poor are young, between the productive ages of 15 to 35. If they are gainfully employed,they will fuel India's growth story.According to a FICCI-EY study, by 2020, the world will face a shortage of 47 million workers. India's rural youth, can become a demographic advantage. Are you already a Partner? DDU-GKY is uniquely placed in the skill training eco-system of the country. As part of the Ministry of Rural Development, it caters to the largest youth stream in the country, the 55 million strong rural poor youth between the ages of 15 and 35. Through its parent program of Aajeevika, it has access to numerous Self-Help Groups (SHGs) across the country where the members not only facilitate in mobilization but also in ensuring attendance, facilitating village or community level participation and monitoring progress at regular intervals. It is also connected with rural Employment schemes like the MGNREGA, has credible access to Gram Sabhas and Gram Panchayat through its sister agencies and an experiential knowledge spanning over decades of running successful programs in the hinterland. This ensures that DDU-GKY can facilitate you to access and mobilize a large number of committed youth to training centres. In addition, DDU-GKY has invested in the making of a Quality Assurance framework comprising of Guidelines and Standard Operating Procedures (SOPs) to define minimum benchmarks, systematize processes, define service level standards and build transparency in operations as well as managing delays and defaults, thereby introducing predictability in government process and reducing Inspector Raj. DDU-GKY has also adopted a distributed ERP system, called e-Kaushal and the Public Financial Management System (PFMS) to facilitate programme management, and ensure transparent investments and tracking of fund utilization. Further, DDU-GKY has also introduced an e-learning & certification solution based on its SOPs, thereby building capacity and expertise within your organization. The big advantage in partnering with DDU-GKY is a transparent application, selection and appraisal process. All the forms and documentation are online. PRN and Project Proposal. The online software not only makes it easy to submit, but also automatically prioritizes and scores proposals, without human intervention, and uniformly across the country. So if you are an educational institute of repute, a large employer with training infrastructure or a large private skill training expert with commitment and best practices, DDU-GKY is the right partner to grow with. Who all are eligible to partner with DDU-GKY? Any registered organization (other than proprietorships or partnerships, however a limited liability partnership or LLP is accepted) can apply to be a Training Partners. If you are already registered with National Skill Development Corporation (NSDC) as a partner or work with NSDC as a partner, you can also apply directly to us. 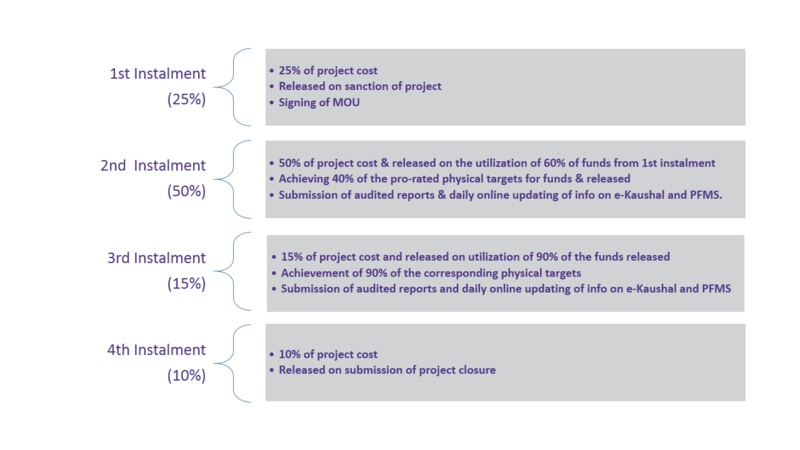 At the time of application, a partner should have positive net worth in at least two of the last three financial years and a turnover of at least 25 percent of the size of the project cost being proposed.DDU-GKY also allows for a consortium of partners to apply, but wherein one partner takes the management lead and responsibility for goals and outcomes. If you belong to any of the above, it's time we start a conversation. Click here to send an email to the to DDU-GKY today. What are a training partners' key roles? Mobilization: Mobilization is the task of getting the "right candidates" into the training program, it involves visiting villages, meeting with all relevant youth, identifying the right candidates through aptitude or psychological tests, counselling potential candidates as well as their families and finally enrolment with necessary documentation. DDU-GKY will assist you in engaging Gram Sabhas, Panchayats and SHGs to aid in mobilization. Further, it will assist you in developing content, psychometric assessments to identify latent strengths, counselling and selection of candidates prior to commencement of training. DDU-GKY also provides states with a support cost for investing in Communications & Advocacy. Some states use this fund to run advertising campaigns, mobilizing youth into mass mobilization camps at the district level. You can participate with the state and other partners in such camps and select eligible candidates for your course. Training: comprises of setting up of a training centre in compliance with the norms and standards of DDU-GKY SOPs and delivering the program at the centre using industry relevant training, technology enabled and innovative training content, qualified trainers, pedagogy, engaging training methods, work readiness inputs, and work oriented counselling. Training duration can range from 576 hours to 2,304 hours (from a minimum of 3 months to a maximum of 1 year) and allows for On-the-Job Training (OJT) as well. As part of training, there are other responsibilities as well, like provision of Aadhaar cards or equivalent, starting a bank account, provision of uniforms and stationery among other candidate entitlements. Kindly refer to the Guidelines and SOPs for a complete list. Training Assessment and certification: is about facilitating Independent third party certification to assess the skill, knowledge and attitude of trainees. DDU-GKY works with NCVT or SSCs of NSDC for curricula, assessment and certification. All successful eligible candidates will be provided with relevant government recognized and cobranded Skills Certificates. Placement: While every effort is to be made to ensure that trainees get jobs that match their aspirations and aptitude, a minimum placement of 70% of trained candidates is essential for success. According to DDU-GKY norms, a candidate is considered placed only after 3 continuous months of work. Facilitating placements and tracking performance over 1 year, with 3 months of intensive engagement is also part of the placement process. Post placement support: Candidates placed often have very myriad needs, both monetary and psychological. Providing candidates with assistance in terms of adjusting in a new city or helping them manage their monthly finances is a key responsibility. It ensures that the individual moves into regular income and economic independence, the primary aim of DDU-GKY. Also, DDU-GKY offers monetary incentives for candidates to remain in jobs. Refer to investment norms below for more details. So how do we decide whether the partnership is a good fit? We have identified and notified a 4-stage transparent appraisal process and have set up anEmpowered Committee [EC] that convenes for project approvals. The notification can be found in the Resources tab. We review each application independently, with a focus on the readiness of the partner and the best interests of candidates and employers. We look for alignment of values and beliefs, financial and proposed project merits, relevant skilling and placement experiences, team and capacity of the team, transparency and accountability and the readiness to implement the project as key criteria. Based on these, automatic scores are awarded which determine the rating, investment and the extent of investment. The first step in putting together a project lies in identifying which job-roles or courses would you like to offer.We'd like you to identify and administer training for trade-specific skills [you can look-up the NCVT roles/ SSCs] to meet industry demand. Coming from rural India, our youth require some additional inputs to prove themselves and retain jobs. This calls for training in soft skills, functional English and computer education (basic IT skills) in addition to training for domain skills. These are essential ingredients that we believe, will enable our candidates to work and grow in their jobs. Our training partners are also welcome to propose and submit multiple projects with multiple trades or job-roles. Each project, however is identified to a State. Multi state projects are not accepted. However, a training partner can propose multiple projects in multiple states in keeping with their business plans and infrastructure or investment capacity. Together, we want to transform rural poor youth into an economically independent and globally relevant workforce. Together, we are committed to manifesting this transformation and moving people from poverty to productivity and prosperity. At DDU-GKY we follow a fixed cost model and incentives linked to successes in outcomes to training partners whomeet eligibility requirements. We also encourage innovations, not only in training and pedagogy, but also in projects on the whole. The investment model follows the preferences indicated earlier, through a simple process of categorization of partners and projects. The preference list identifies criteria that will earn you, the partner, Category 'A'. if you are an organization offering training and foreign placements for 200 to 499 candidates or if you are Captive Employer offering between 200 and 499 jobs each year, then you will earn Category 'B' status. All others are automatically placed under Category. 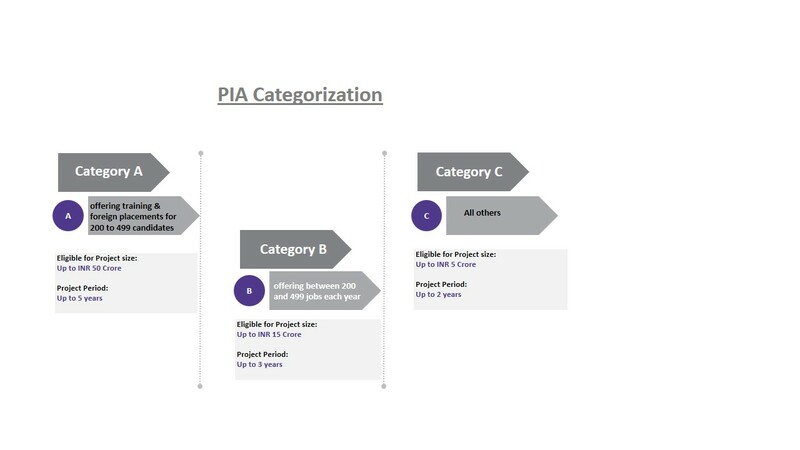 In case of multiple projects, each project will be limited as above, while the relationship with the PIA can be scaled as needed or possible. At present, National Institute of Rural Development & Panchayati Raj (NIRD&PR) and NABARD Consultants (NABCons) serve as our Technical Support Agencies. Ready to become a training partner? Register for PRN with us and prepare to apply for projects. Organisation website, live with organisation details on it. After a verification and validation process by DDU-GKY you will receive a PRN. This will be delivered to you be mail (offline and online). After receiving the PRN, process to fill the Project Application Form through the online portal i.e. https://erp.ddugky.info . The form will provide complete guidance on how to fill it and on all supporting documentary evidences. Submit the Online Application form with complete and accurate details. Become a DDU-GKY Partner, get ready to transform lives. Our Project Proposal Forms are not open all the time. Click here to know when they will be open. We currently have several proposals under review; we will get back to you at the earliest. We currently have several proposals under review; we will get back to you at the earliest. Write to us to know the status of your proposal. The manual of standard operating procedures (SOPs) is provided for those implementing DDU-GKY. The SOPs have been put together after careful considerations and a number of discussions involving different stakeholders. We have also created an E-learning module on SOP, so that there is clarity in implementation, for any queries on the SOP or how to use the E-learning module, click here to write to us. State Skill Development Missions are very active, know more about their initiatives. IndiaCan is one of DDU-GKY's partners to help us bring about a wave of prosperity, growth in rural India by transforming our youth into a skilled and globally relevant workforce.